SPIT-ROASTED PRIME RIBS, crusty on the outside, moist and tender inside. Yes! CHICKEN UNDER A BRICK, heady with smoke and spice. Yes! CURRY-GRILLED LAMB KEBABS, POTATOES ROASTED IN THE ASHES, BAYOU WINGS, VANILLA-GRILLED PINEAPPLE WITH DARK RUM GLAZE—all of it infused with honest-to-goodness real-grilled flavor, and all of it cooked indoors. Yes! 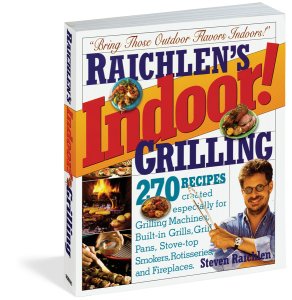 Bursting with bold new ideas, 270 righteous recipes, and hundreds of tips and techniques—from how to season a cast-iron grill pan to buying brisket cut from the “flat”—Raichlen’s Indoor! Grilling brings the guru’s mastery of live-fire cooking indoors. New every day’s a good day to grill.